Tim Burton’s live action adaptation of the Disney classic Dumbo fails to meet the promise of magic and wonder. The tone of the film hits one note and flat line for the whole duration on cheap cinema tricks that only increase the ever inflating shock value. Disney, in recent years, remade many of its films such as Beauty and the Beast and Cinderella into live action projects. Raking in billions in commercial success. Burton brought this nostalgia movie trend to viewers in 2010 when he directed the new iteration of Alice in Wonderland. We are left to wonder as a fans and avid Disney fanatics: why Burton directed this movie so safely? Disney released the original cartoon in 1941. The movie’s plot is simple and heartwarming, the traditional style of Disney for their movies at that time. 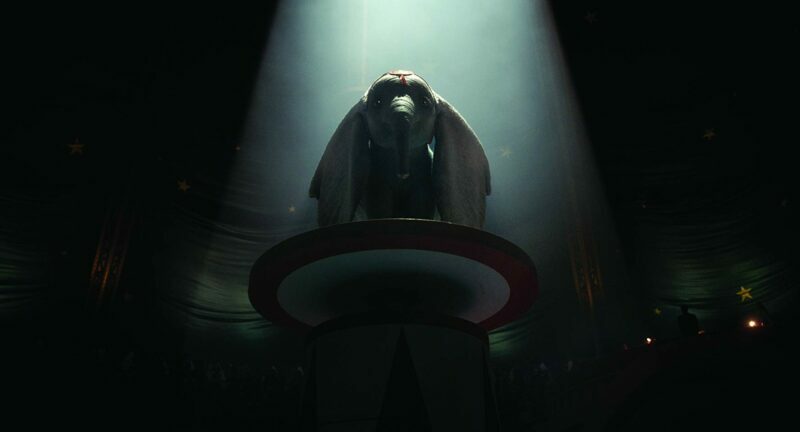 Dumbo is an elephant who is mistreated by both mankind and fellow circus animals for his abnormally large ears. He soon befriends a circus mouse named Timothy Q. Mouse who helps Dumbo on a long journey to learn how to find his way in the world and master his ability of flight. The new version is a slightly darker take. Dumbo is the protagonist, but is given a disproportionate amount of screen time. Dumbo’s silent demeanor puts his multitude of character development opportunities to waste. The fact that Dumbo is not only an elephant but also a character without dialogue, which creates a barrier between the main character and the audience. As a side effect, the veteran supporting cast, starring Danny Devito from It’s Always Sunny in Philadelphia, Colin Farrell from True Detective, Alan Arkin from The Kominsky Method, Michael Keaton from Birdman, Eva Green from Penny Dreadful, is left entirely unattended to and as a reminder to the audience of the missing plot points which are highlighted at the movies conclusion. Case in point, the two child characters. Joe and Milly Farrier, whose characters operate as Dumbo’s adoptive family and companions, are portrayed as kids from a broken home traumatized by the death of their mother reunited with their father Holt Farrier (Colin Farrell), who was drafted in WW2 abandoning them. Despite this setup, the kids come off as distant, fake, and sometimes creepy with the son’s, Joe Farrier, unexplained and awkward body language yet seemingly happy. This is only made worse by the daughter’s, Milly Farrier, weird stares and mannerisms. We are led to believe, by Burton, the children hold the secret key to Dumbo’s ability to fly, but are never told or shown as to why. The father of these two miscreants, Holt Farrier, is the supposed to be the unsung war hero coming home to a world that no longer demands what Holt offers. The movie introduces Holt to the audience as handicapped by an amputated arm from the war effort. This is done to create an obstacle for Farrier to overcome so as to build a personal relationship with the audience and create interest. However, this challenge is never met or confronted. The problems Farrer’s disability brings him is illustrated through dialogue and real world interactions with the environment around him, yet how he solves this issue is never discussed or demonstrated. This main staple of the movie ends up being forgotten, like many other key elements and character arcs, and shoveled to the end of the movie where it is treated as a resolved conflict, while the audience is left in confusion. Cinematography wise, the film is shot nicely with adequate computer generated imagery (CGI), but this only provides temporary distraction to the movies main flaws. Additionally, the soundtrack to this film showed promising results in the trailer, but the movie does little with any sort of music besides basic background audio. This comes as a surprise given Dumbo’s infamous song Baby Mine by the Ronettes which is in fact represented at the end credits scene in a cover version by the band Arcade Fire. The new version of the song is quite a cute rendition and sung well, and is missed dearly in the film as a feature song. The flick meets all the satisfactory levels production wise of a movie, but that itself is the problem. Burton is not a director you could accurately describe as mundane, predictable, or normal. The same principle applies to his various motion pictures. The Corpse Bride and The Nightmare Before Christmas both set the standard for claymation style movies and propelled them to the mainstream by adding a musical element to them. Beetlejuice and Edward Scissorhands offered raunchy, raw, peculiar characters that at first glance would be considered otherworldly but are soon discovered to be as human as the rest of us while also providing commentary about the real world itself subliminally. Point in case, Burton is a risk taker who provides authentic, creative, and unique projects to a loyal fan base who has admired him over the years for his distinctive style. Dumbo is more of an exception to the rule that other Burton movies followed. A similar, if not congruent, motion picture could’ve been produced with any of the other directors Disney has working on similar live action remakes such as Jon Favreau (Lion King) or Niki Caro (Mulan). What did you think of Tim Burton’s Dumbo? Let us know in the comments below! This is pretty true. I thought this version of Dumbo was really strange and confusing.